Turkish President Abdullah Gul has called on France to halt plans for a law criminalising the denial of the mass killing of Armenians by Ottoman Turks during World War I as genocide. The French lower house of parliament is due to consider a bill that proposes a one-year prison term and a heavy fine. 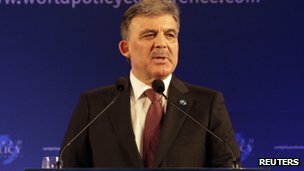 Turkey has warned of irreparable damage to ties if the legislation is passed. Armenians say up to 1.5 million people died during mass deportations. Turkey puts the figure at closer to 300,000. Ankara says Turks were also killed when Armenians rose up against the Ottoman Empire during World War I when Russian troops invaded eastern Anatolia, now eastern Turkey. In a statement, President Gul said the proposed legislation, set to go before the National Assembly on Thursday, denied Turkey the freedom to reject "unfair and groundless accusations". He also suggested that France was jeopardising centuries of friendship because of "small political calculations". A delegation of Turkish MPs and businessmen has travelled to Paris to lobby against the bill and was due to meet Mr Sarkozy's diplomatic adviser, Jean-David Levitte, and French Foreign Minister Alain Juppe. Last week, Turkish Prime Minister Recep Tayyip Erdogan wrote to French President Nicolas Sarkozy warning him that bill was "hostile" and directly targeted Turkey and Turks living in France. "Such steps will have grave consequences for future relations between Turkey and France in political, economic, cultural and all areas, and the responsibility will rest with those behind this initiative," the Anatolia news agency quoted him as saying. Mr Erdogan also told a news conference on Saturday that the National Assembly should instead look into France's actions in Africa. "It could investigate how many people French soldiers massacred in Algeria, and their involvement in the killing of 800,000 people in Rwanda [in 1994]," he said. Trade sanctions against France have also been mooted. Almost 1,000 French businesses are said to be active in Turkey. Future Airbus orders by Turkish Airlines and major government investment in energy were held out as examples of potential targets for retaliation by a senior member of the Turkish delegation in Paris. Volkan Bozkir, head of Turkey's foreign affairs committee, said the delegation aimed to have the bill removed from the National Assembly's agenda, and failing that, to have it voted down by the upper house of parliament, the Senate. The terms of the bill are similar to one that was passed by MPs in 2006 but not debated by the Senate. Although the new bill has been proposed by a member of Mr Sarkozy's UMP party, Valerie Boyer, the government argues that it is not behind the initiative. Speaking on French TV on Tuesday, government spokeswoman Valerie Pecresse said the debate would go ahead as planned. "It doesn't involve a legal proposal on the Armenian genocide," she stated. Rather, she said, it was about "all acts that resemble genocide". Ms Pecresse added that France saw Turkey as an ally and partner.